The Emperor and Empress of Japan, leaders of several chemical societies, multiple Nobel Prize winners, the IUPAC president, and other renowned chemists joined the Chemical Society of Japan (CSJ) for its 125th anniversary celebration. The ceremony, held on 19 March 2003 at the Rhiga Royal Hotel in Tokyo, was followed by a tea and celebration party. Ryoji Noyori, 2001 Nobel Laureate and 2002 CSJ president, was the master of ceremonies and gave the opening address. Invited to the ceremony were representatives of international chemical organizations and societies: Prof. Pieter Steyn, IUPAC president; Prof. Barry N. Noller, president of the Federation of Asian Chemical Societies; Prof. Howard Alper, representative of the Canadian Society for Chemistry; Prof. Daoben Zhu, vice president of the Chinese Chemical Society; Prof. François Mathey, president of the Société Française de Chimie; Dr. Rudolf Staudigl, vice president of the Gesellschaft Deutscher Chemiker; Prof. Francesco De Angelis, vice president of the Società Chimica Italiana; Prof Sang-Chul Shim, president of the Korean Chemical Society; Prof. Sir Harold Kroto, president of the Royal Society of Chemistry, UK; Dr. Elsa Reichmanis, president of the American Chemical Society (ACS); and Prof. Shie-Ming Peng, president of the Chemical Society Located in Tapei, Taiwan. 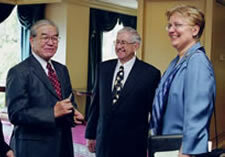 Hitoshi Ohtaki (left)IUPAC Executive Committee member, president of the Pure Science Division of the Science Council of Japan, and professor emeritus at the Tokyo Institute of Technologyconversing with 2000 ACS President D. Busch and 2003 ACS President E. Reichmanis. At this occasion, a number of distinguished scientists who have contributed significantly to the society were made honorary members of the CSJ: 1996 ACS President and Columbia University Professor Ronald Breslow, 2000 ACS President and Kansas University Professor Daryle H. Busch, 1996 Nobel Prize recipient and Sussex University Professor Sir Harold Kroto, 1981 Nobel Prize recipient and Cornell University Professor Roald Hoffmann, 1986 Nobel Prize recipient and Taiwan Academia Sinica Professor Yuan T. Lee, and 1987 Nobel Prize recipient and University Louis Pasteur Professor Jean-Marie Lehn. The ceremony occurred in a friendly but formal atmosphere. The presence of the Emperor and Empress attracted significant attention to the anniversary celebration and their public standing helped to highlight the CSJ and its activities. The event acknowledged the achievements of Japanese chemists, but also the need for continued support and development of chemistry in the country. Chemical research in Japan is subject to financial constraints, often due to the high cost of imported equipment. Concerns about the lack of interest in chemistry within Japan from both industry and young students intensified the need for a high-visibility event. 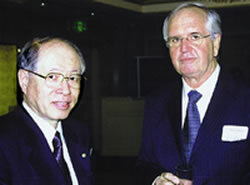 The program included messages from many of the major chemical societies throughout the world, as the Japanese Chemical Society is a solid contributor to the international chemistry community. After the ceremony, invited guests and honorary members were introduced to the Emperor and Empress, and discussions on the recent successes and current challenges facing chemistry in Japan continued with great interest. The CSJ was founded under the name "Tokyo Chemical Society" in 1878, by a group of about 20 students. In 1912, the Chemical Society of Japan joined IUPAC's predecessor, the International Association of Chemical Societies, which was dissolved to form IUPAC in 1919; Japan then became a member in 1921. Today, there are more than 50 active members on IUPAC bodies, and approximately 70 fellows. The CSJ is cosponsoring the Pacifichem Conference with the ACS, the Canadian Society for Chemistry, the Korean Chemical Society, the New Zealand Institute of Chemistry, and the Royal Australian Chemical Institute. The CSJ has been a member of the Federation of Asian Chemical Societies since 1981. It maintains close ties and regularly exchanges information with the Chinese Chemical Society. It also holds close ties to the Italian Chemical Society, French Chemical Society, the German Chemical Society, and the Royal Society of Chemistry. On behalf of IUPAC, Prof. Steyn formally presented Prof. Noyori with a message and gifts at the banquet. In his message to the CSJ, Prof. Steyn said that progress in science requires interaction among practitioners. "These interactions are of course individual; groups do not interact, only their individual members interact. However, groups can facilitate the interaction among their members. That is a role of chemical societies, both internally and externally" said Steyn, and "IUPAC is grateful for the cooperation of the CSJ in the furtherance of its mission." Page last modified 3 September 2003. Copyright © 2002-2003 International Union of Pure and Applied Chemistry.